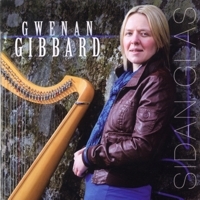 Sidan Glas (Blue Silk) displays the whole range of Gwenan Gibbard's talents, as harpist and singer, as composer and arranger, and in Maartin Allcock she has found a kindred spirit who compliments her with great skill. They are joined by other renowned instrumentalists and the result is a great tapestry of diverse musical influences which yet remains true to the Welsh folk music tradition. A song published in (Journal of the Welsh Folk Song Society), 2008 sent to the journal by Buddug Lloyd Roberts, the song was noted by Tal Griffiths, Pwllheli, from the singing of Thomas John Roberts, Pwllheli, in 1945. It tells of the homely pursuits of a family of country folk, settle by the fireside on a winter's evening - a picture of diligent contentment, from mother's knitting, the maid's candlemaking and father's singing to Huw's clog making. But out in the cold back kitchen another maid sits glum and shivering, waiting in the moonlight for her sweetheart, Wil. And all the while, on the fire the porridge bubbles merrily away in the pot, thickened nicely by the occasional wood shaving from Huw's clogs! A brand new hornpipe followed by two from the repertoire of 19th century harpist, Llewelyn Alaw (1828-1879). Pibddawns Heol y Felin was composed by John Jones, Harper of Lanofer. Old traditional verses expressing a young girl's longing for her sailor sweetheart who is far away on foreign seas. A tounge in cheek traditional song in dialogue form, where the man tries his best to win over his loved one. After failing miserably at first, by the end of the song the girl finally succumbs to his charms! First published in the journal of the Welsh Folk Song Society in 1910. This song was amongst a collection of unpublished songs entered for a competition in the Llanfachreth Eisteddfod, 1922. Only one verse was noted. The following verses come from another song which Dr J Lloyd Williams heard from the singing of Dafydd Cadwaladr, an old sailor from Cricieth. Maartin Allcock - guitar, bouzar. The poet Trebor Roberts here gives us a vivid description of Gwenno Tir Mawn and the simple life she led in her remote cottage in the highlands of rural Wales. Trad, arr Gwenan Gibbard, ©Sain. Another of the old traditional harp airs, followed by a beautiful melody by Haydn Morris, from Llanelli - a prominent figure in the Cerdd Dant field in Wales during the first half of the 20th century. The first jig comes from Nicholas Bennett's collection while the second came to me while I was looking for a suitable tune to be included in this set. Shonc Bogel is an old tune which has been popular in Wales for centuries. It featured in the collection of the 18th century fiddler John Thomas. One of J Glyn Davies' songs from his published collection of sea shanties, Cerddi Portinllaen. Although it is a variant on the old tune Spanish Ladies, in J Glyn Davies' words: "This tune goes too far back in my memory to be sure of the source of this version. I may have picked it up in Liverpool about the Sailors' Home, or in the Welsh Harp pub, or in the Llyn Peninsula". The song is an old seaman's romantic recollection of happier times on board one of the three-mast schooners which often sailed from the busy, bustling harbour of Portinllaen on the beautiful coast of north west Wales to all parts of the world. The launch of a new ship was a big event and often coincided with the launch of brown paper model yachts on a small duck-pond near Nefyn, called 'Pwll Pen yr Allt'. Old traditional verses praising the virtues of the harp and all things associated with it. The song of the Leyshon family, Glyn Neath. A song published in Maria Jane Williams' Ancient National Airs of Gwent and Morgannwg (1844), which is also found as an instrumental melody in Dr J Lloyd Williams' manuscript collection. The second tune was collected by Lady Ruth Herbert Lewis in 1913 from the singing of Henry Williams, an old weaver of Llansannan, who said they used to sing it at the factory there while spinning. An unusual tune from Llewelyn Alaw's collection followed by two popular slip jigs. Meeting Kuljit on the Distill music course in Trigonos, Nantlle, led to this collaboration. A sweet sad song with hard words of advice. If you are heart broken, tell no one as no one will mend it for you. On the other hand, if you find happiness and success, again tell no one lest it should all slip through your fingers as you boast of it. Recorded at Sain Studios, Llandwrog, April 2009 by Maartin Allcock and Sion Alun Jones. Mastered by Siwan Lisa Evans. Track notes by Gwenan Gibbard. Thanks to Maartin Allcock, Stephen Rees, Angharad Jenkins, Dafydd Roberts, Dewi Ellis Jones, Kuljit Bhamra, Buddug Lloyd Roberts, Meredydd Evans, Mei Lewis, Dafydd Iwan, Eryl Davies, Sion Alun Sain.